During the 30 years field biologists have been studying the Hawaiian monk seals of the Northwestern Hawaiian Islands, they’ve been hiking over the sand, volcanic rocks, exposed coral reefs, and ephemeral islets that these endangered mammals call home. A good pair of binoculars and sharp eyes was the best way to spot the seals and track their dwindling numbers. The work is difficult, dangerous, and sometimes disheartening, but critical to the monk seals’ survival. Yet out here in the North Pacific aboard the research ship Oscar Elton Sette, the mood among the staff and crew of the Hawaiian Monk Seal Research Program seems to be shifting. The seals are having a good year—enough pups were born this birthing season to reverse a four-year decline. But something else is promising to make future deployments in this remote archipelago more efficient: drones. For the first time, the research team is testing how drones—or in industry parlance, unmanned aerial systems (UAS)—could be used in their bid to save the seals. “The long-term vision would be to have a fixed-wing [UAS] aircraft on all research ships working in the Northwestern Hawaiian Islands, and a hexacopter on every island where there’s a field camp,” says Lieutenant Michael Marino, a pilot with the US National Oceanic and Atmospheric Administration. “But first, we’re running trials,” Marino says, as the fixed-wing Puma flies 65 meters overhead. With a wingspan nearing three meters, the Puma just surpasses in size the two biggest birds with which it shares airspace—the black-footed albatross and great frigatebird. Spotting a seal, the Puma’s powerful camera is zoomed in, bringing into focus the seal’s identifying number, which had previously been stenciled into its side using bleach. In-camera body measurements taken by the Puma from 90 meters overhead come within four centimeters of direct measurements taken by a biologist in the field. The experiment in Hawaii is not the first time UAS have been used in marine conservation. In the Aleutian Islands off Alaska, scientists are using similar unmanned aerial systems to survey Steller sea lions, which congregate in areas of challenging terrain. In Patagonia, researchers are using the “SnotBot,” a small four-rotor quadcopter, to collect the biological matter released when southern right whales exhale. If the Hawaiian team’s drone plans pan out, they see far more uses for the technology than just studying the seals, says Charles Littnan, lead scientist with the Hawaiian Monk Seal Research Program. The UAS could one day be used to estimate the populations and distributions of seabirds, identify invasive and native plant species, target masses of marine debris, and measure sea-level rise, he says. Another UAS being tested is the six-rotor hexacopter that can help survey areas too dangerous for biologists to access, such as the base of a steep cliff or a beach during big surf. 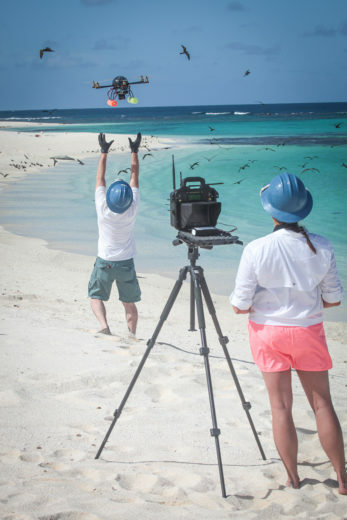 Unmanned aerial systems are growing in popularity in many scientific fields and industries, but out here on the uninhabited Northwestern Hawaiian Islands the team is freed from many of the challenges faced elsewhere. On these remote atolls there is very little air traffic to contend with, and there are no neighbors to annoy. No neighbors, that is, except the seals. 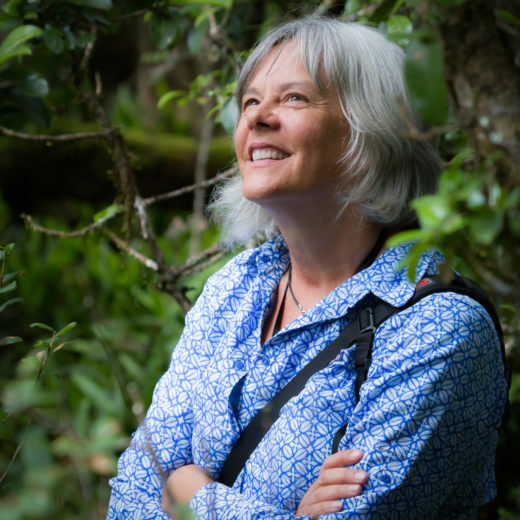 One of the team’s overriding research goals has been to see how the wildlife react. No matter how efficiently the Puma can measure a sickly seal, or how quickly a hexacopter can spot an animal entangled in marine debris, UAS will be dead in the water if they annoy the very animals the team is trying to save. In their tests, the team took the hexacopter through repeated takeoffs and landings, and sent it to hover as low as 10 meters above resting monk seals. Some seabirds did flush at take off, while others approached the hexacopter in the air. But not a single bird strike was recorded. And the seals? One or two lifted their heads, looked around, and then went back to sleep. Cite this Article: Kim Steutermann Rogers “Hunting Seals with a Puma,” Hakai Magazine, Oct 15, 2015, accessed April 23rd, 2019, https://www.hakaimagazine.com/news/hunting-seals-puma/.